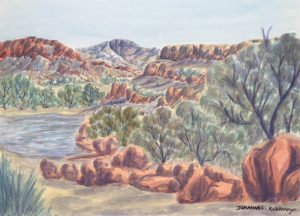 Albert Namatjira was born at the Hermannsburg mission on the 28th of July 1902. 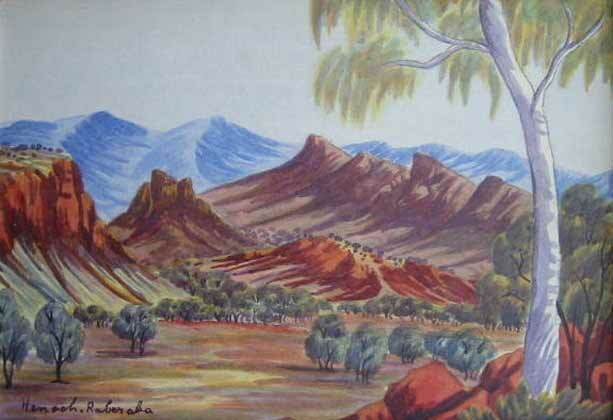 He was named Elea and was the first son of Namatjira and Ljukutja of the Western Arrernte Tribe. 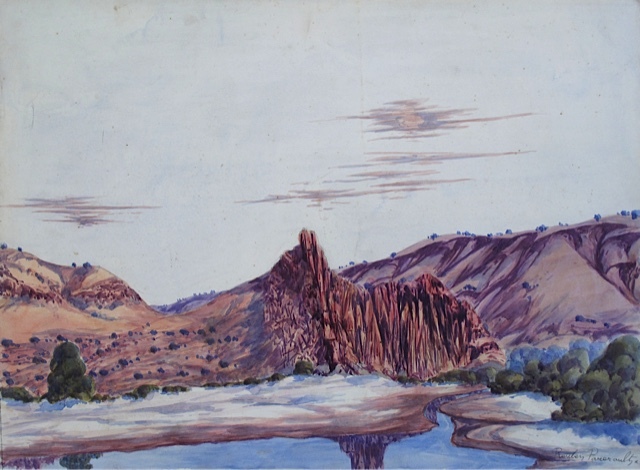 In 1905 on Christmas eve he was baptized and given the name Albert, in the same ceremony his parents were named, Jonathon and Emilie. 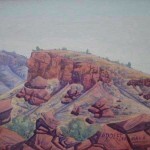 At the age of eighteen he eloped with his wife Ilkalita. Together they were forced to live in neutral country for three years because Ilkalita, later baptized Rubina, had been denied to him under tribal law and was also not a Christian. 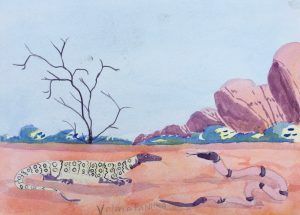 When they returned to the mission Albert got a job as a cameleer between Oodnadatta and Alice Springs and also worked as a carpenter and blacksmith. 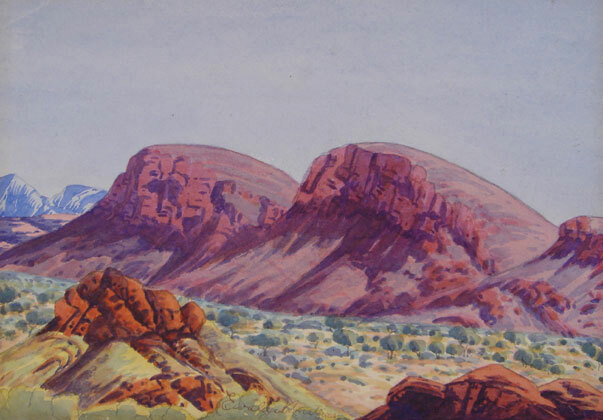 In the late 1920s he became involved with Albrecht’s craft work enterprise and in 1932 received a commission from Police Constable W. Mackinnon to make a dozen oval plaques featuring his camel patrol. 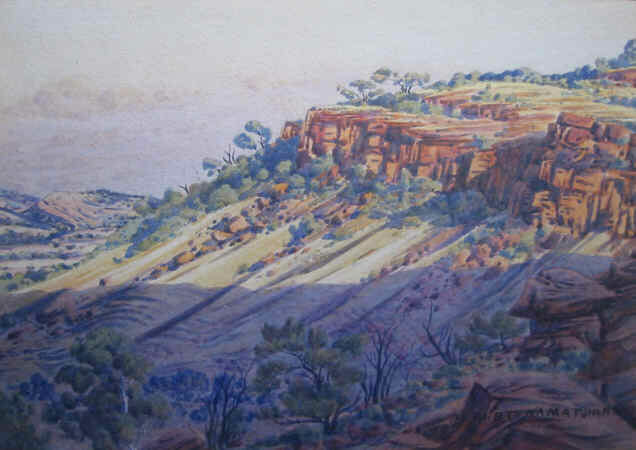 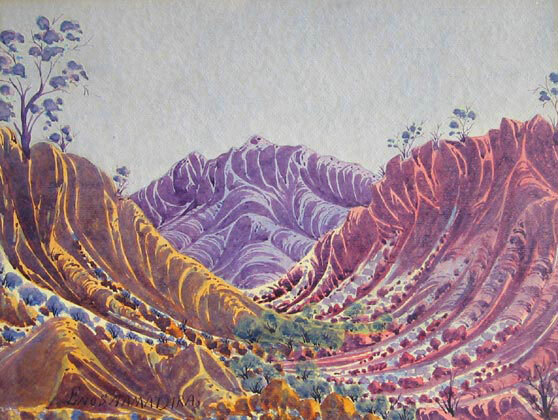 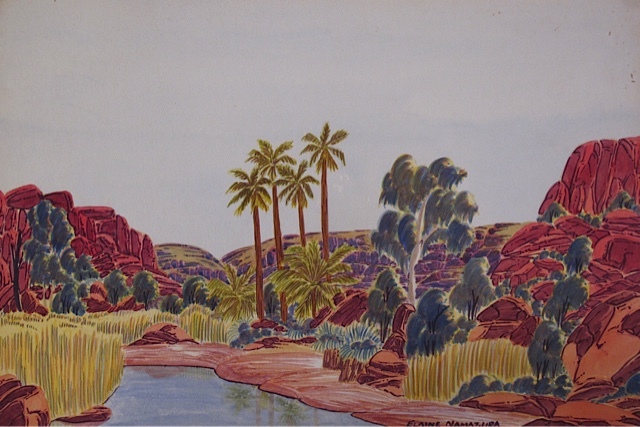 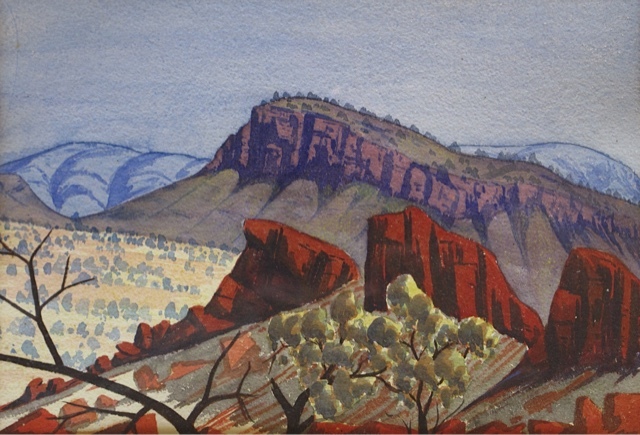 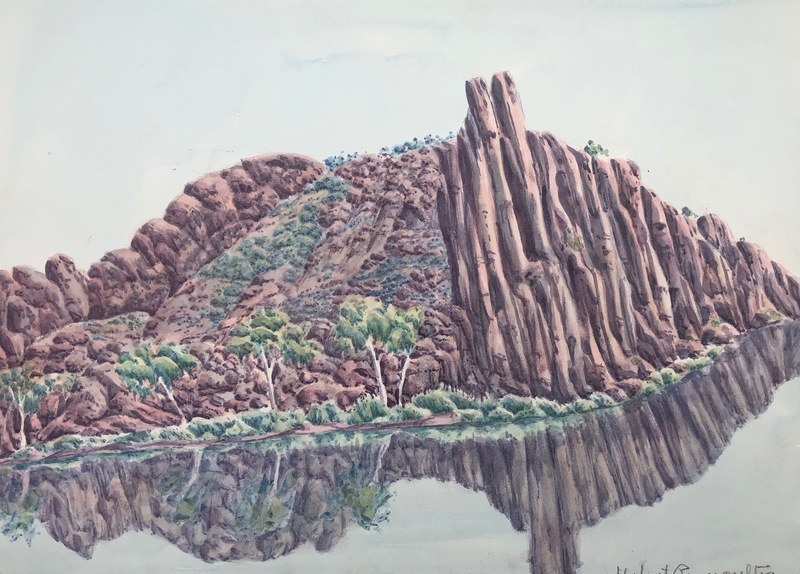 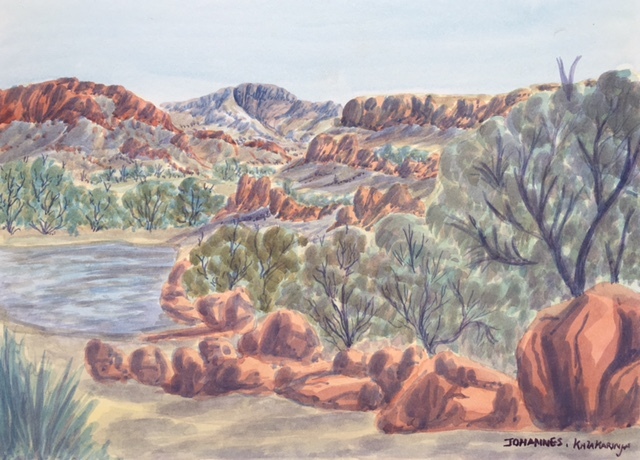 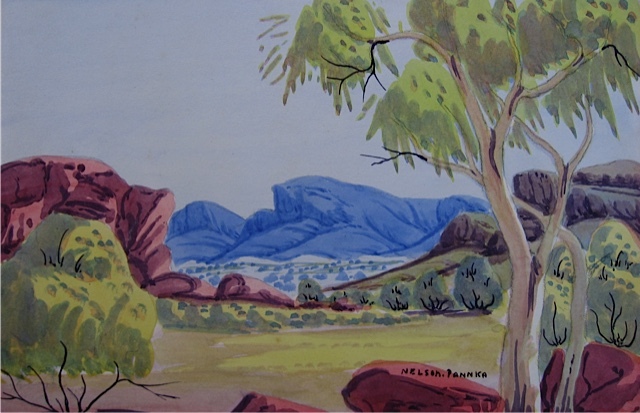 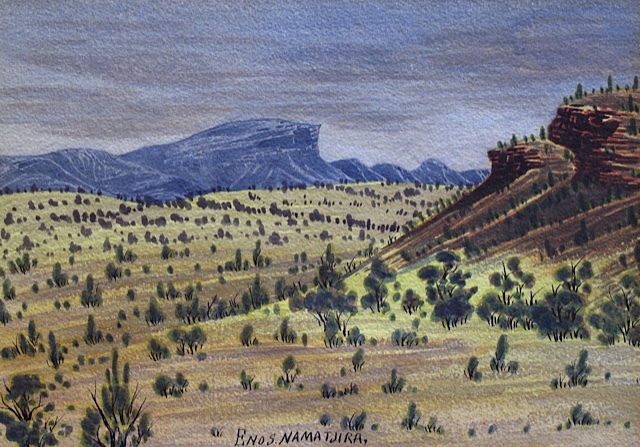 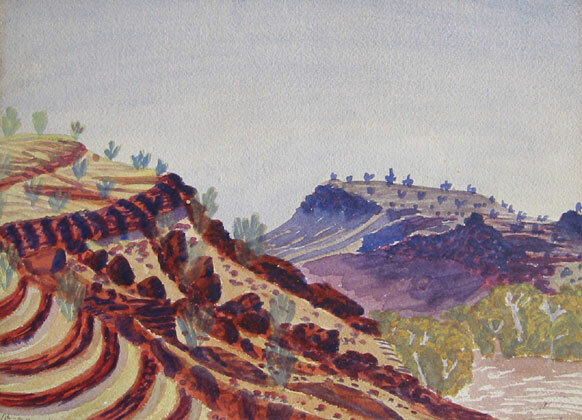 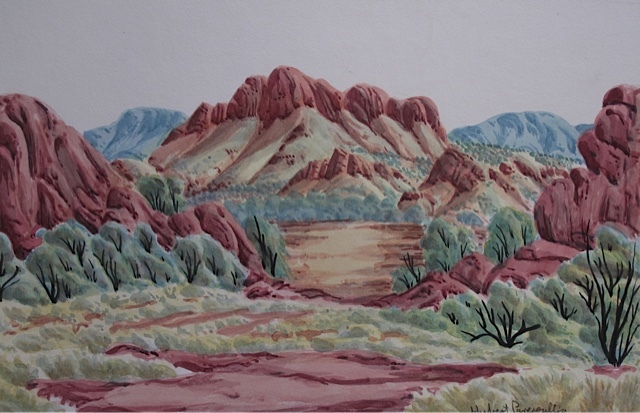 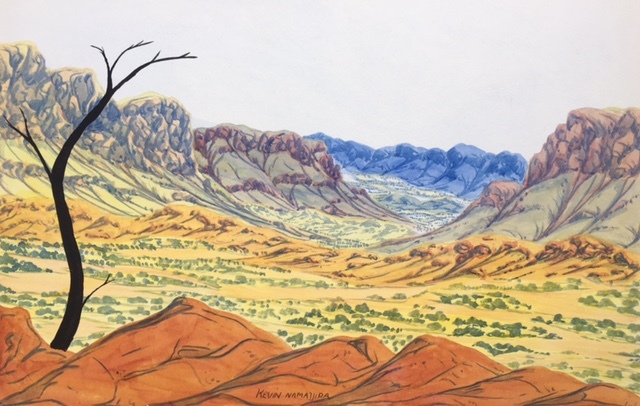 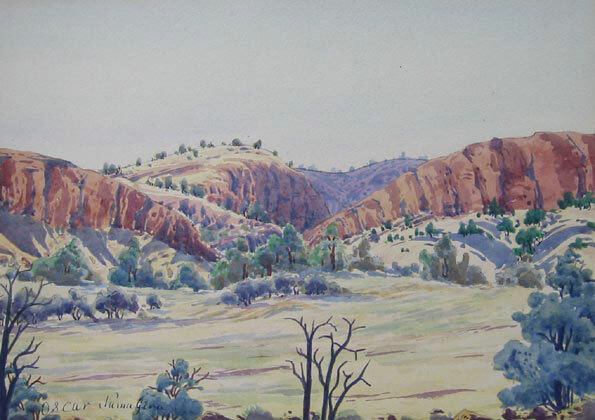 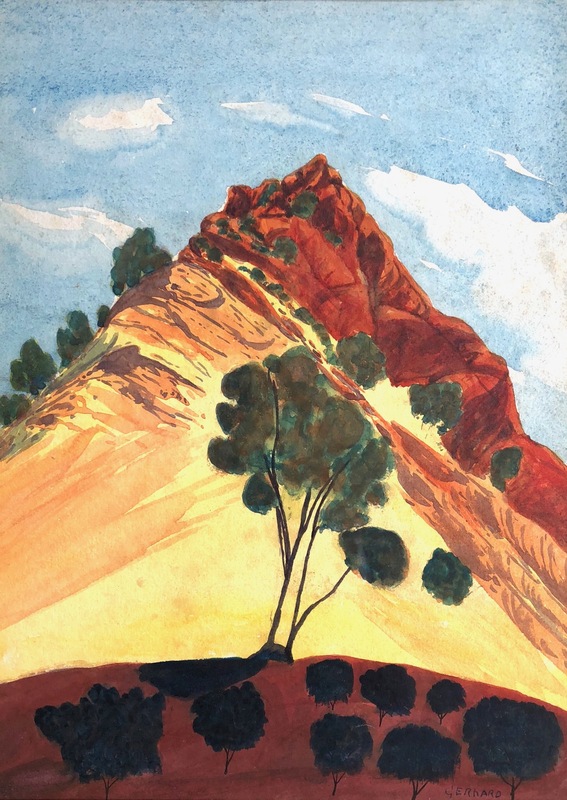 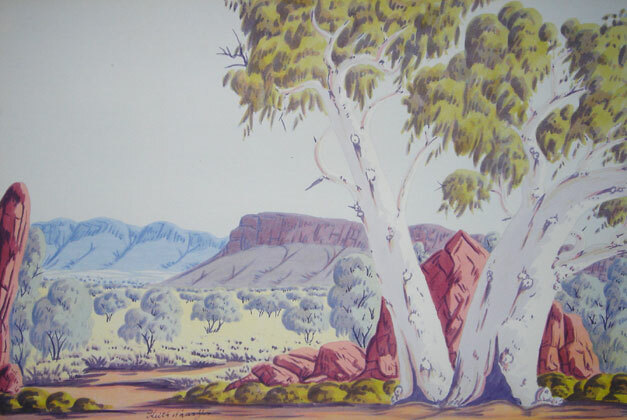 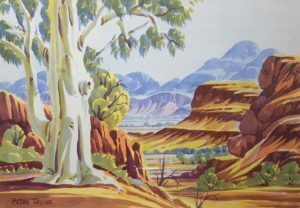 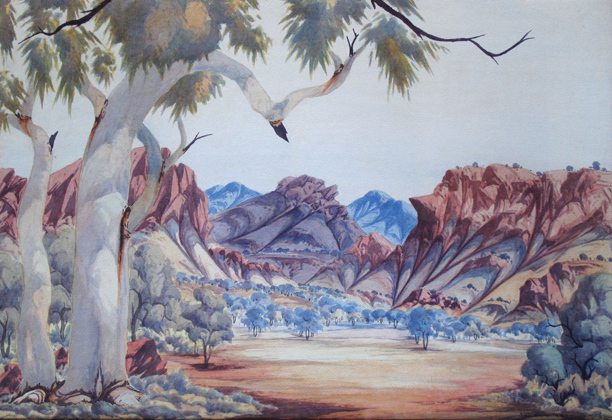 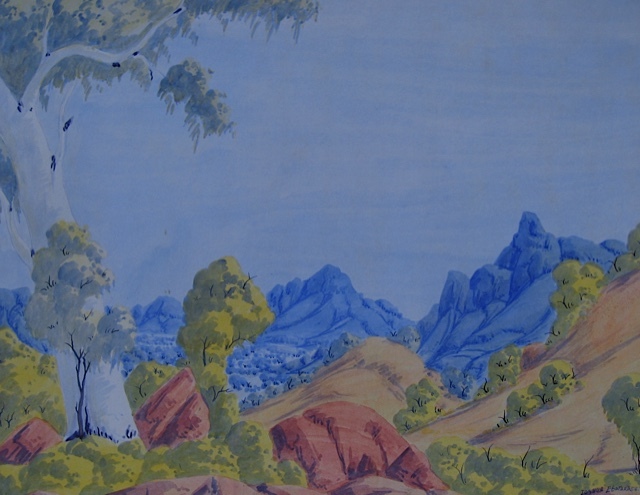 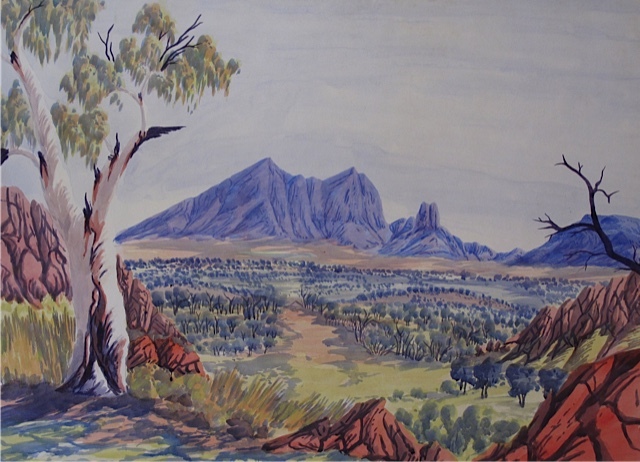 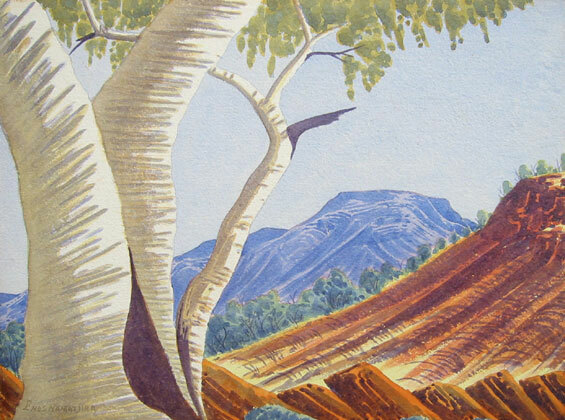 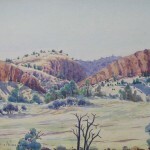 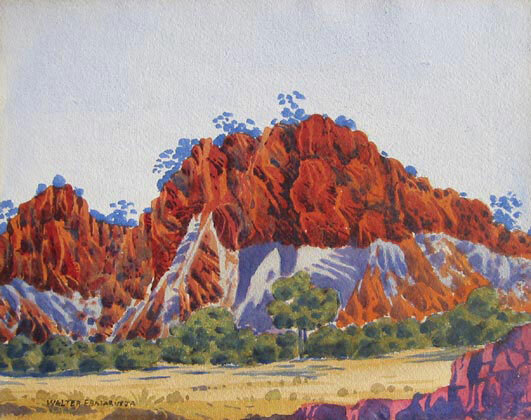 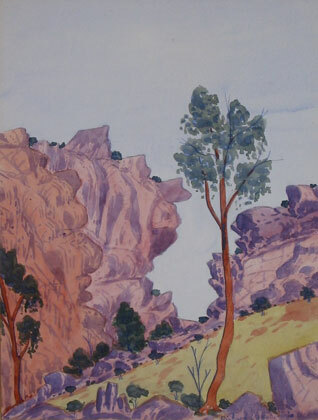 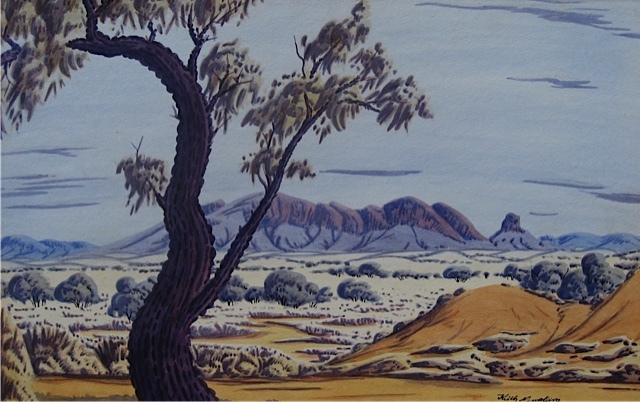 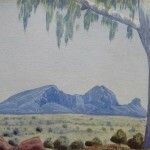 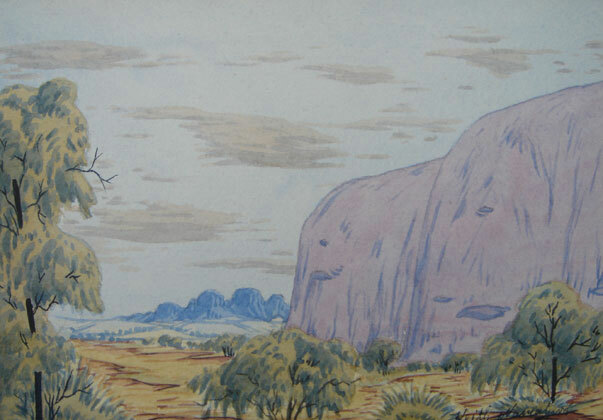 Albert became interested in watercolour painting after seeing an impromptu art exhibition at Hermannsburg in 1934 featuring the works of traveling artists Rex Battarbee and John Gardner. 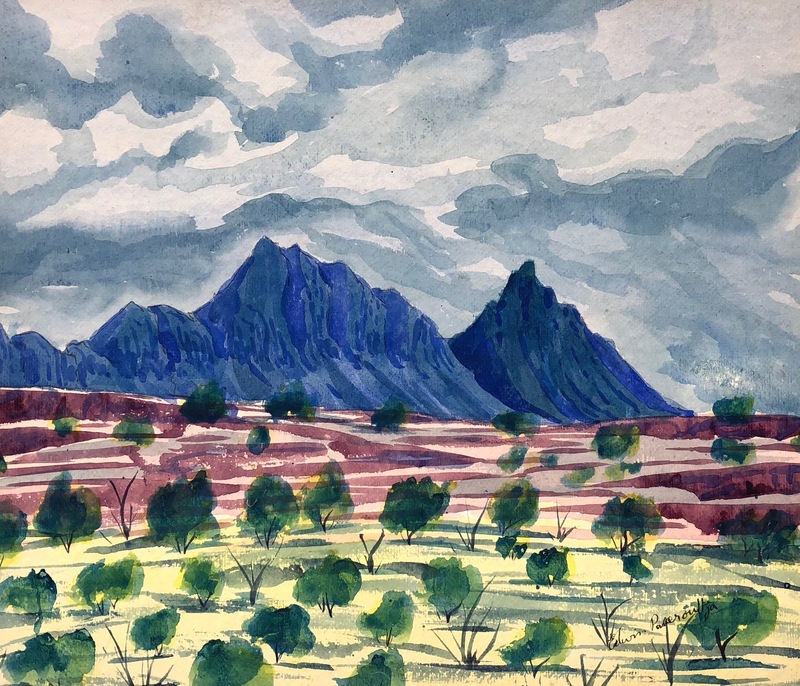 The paintings amazed Albert who immediately asked Pastor Albrecht if he too could paint. 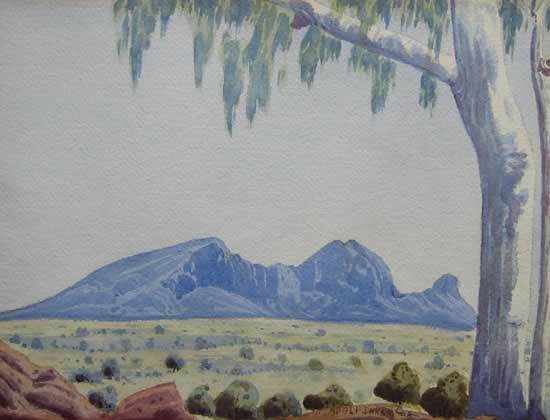 Albrecht initially dismissed his enquiry but Albert persisted and Albrecht then consulted with Battarbee who offered to give him lessons. In 1936 Battarbee returned and commissioned Albert as his camel boy to take him on a painting trip. 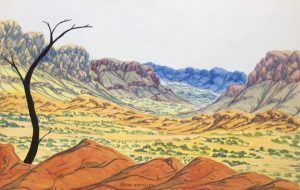 Albert guided Battarbee through some of the most spectacular country in Central Australia, including Palm Valley, The James Range and Gosses Gorge and in return received his long awaited lessons. His first paintings were signed simply Albert. 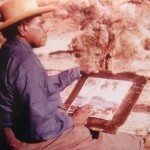 It was not until he started exhibiting that it was thought necessary for him to have a second name. He chose his fathers traditional name and signed his works, Albert Namatjira. 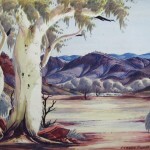 His first major public exhibition was opened in Melbourne on the 5th of December 1938, all 41 works sold within days. 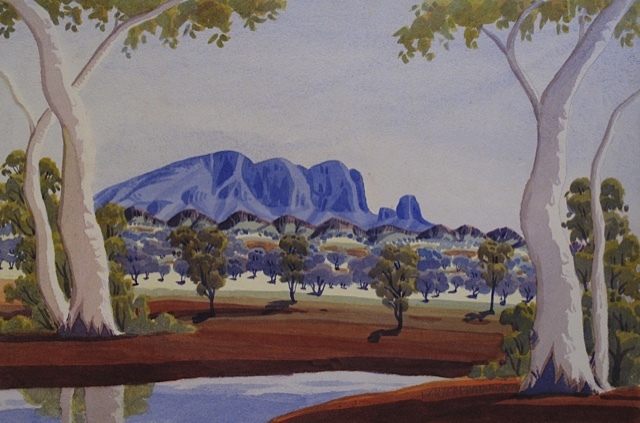 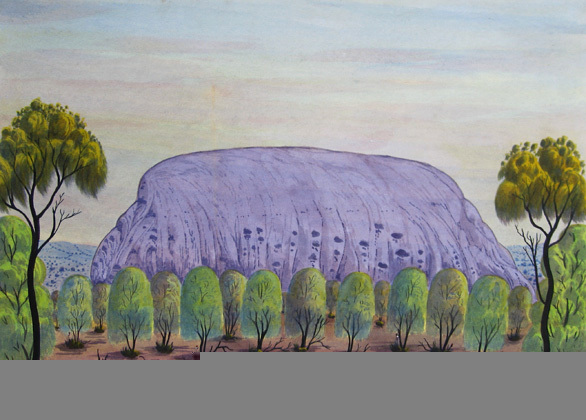 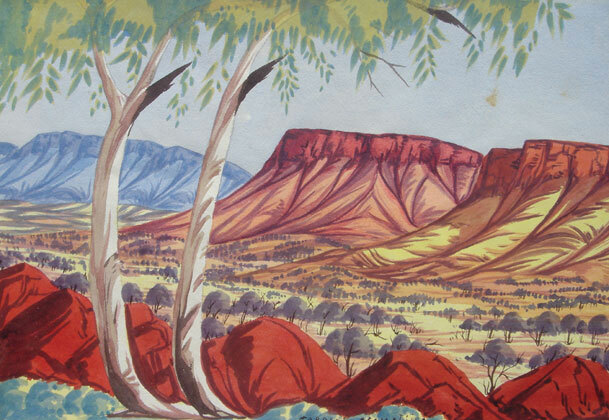 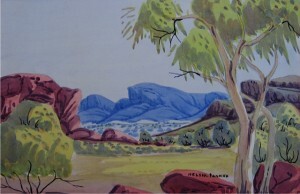 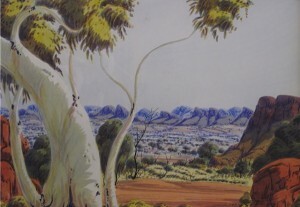 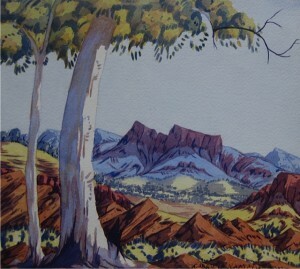 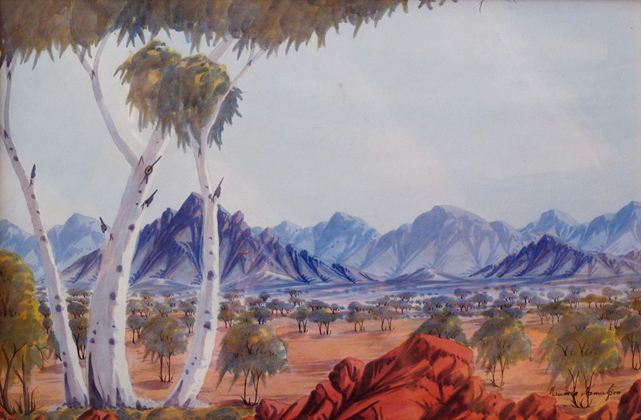 During the second world war Albert sold his paintings to Australian and American soldiers based in Alice Springs. 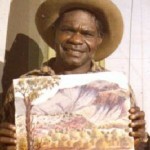 A shortage of materials forced him to substitute paper for local beanwood which he crafted into smooth wooden plaques. 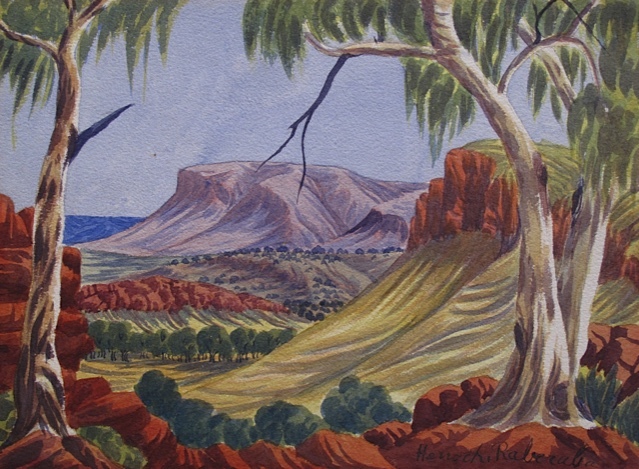 Alberts reputation grew after the war and exhibitions of his work were held across Australia. 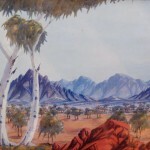 In his lifetime he met with dignitaries from around the world, including the Queen of England but despite his fame he longed for the peaceful surroundings of his homelands. His paintings divided critics but today hang in all state galleries including the National gallery of Australia which has a collection of Hermannsburg art on permanent display in its Indigenous art wing. 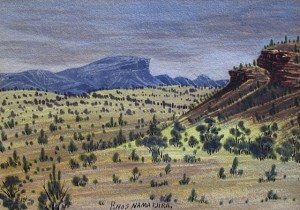 Enos was born in 1920. He attended mission school before finding work as a camel boy. 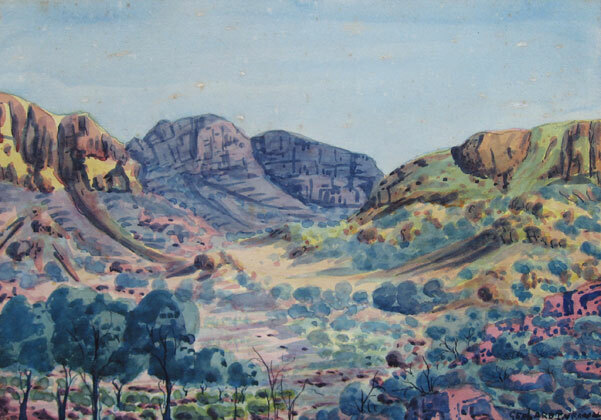 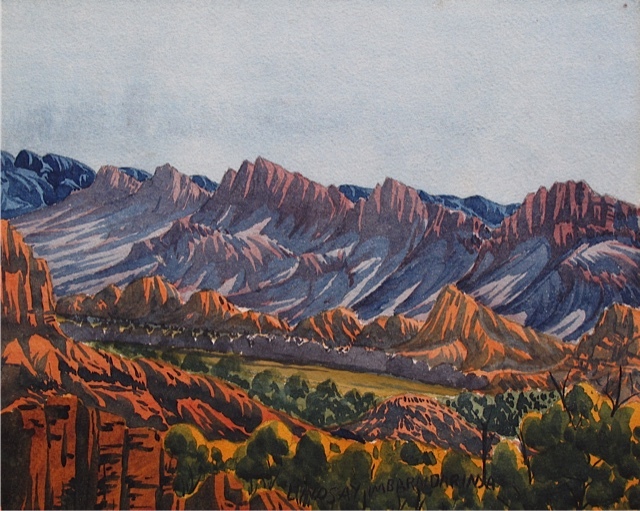 One of his first jobs as a cameleer was in 1938 when he was commissioned by his father and Battarbee to accompany them on a painting trip into the MacDonnell Ranges. 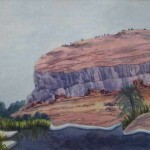 He took up painting in 1945 and was a keen contributor to the Hermannsburg handicraft initiative. 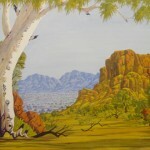 He produced a few figurative works depicting hunting scenes. 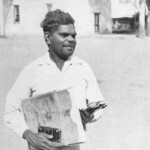 Son of Enos Namatjira b. 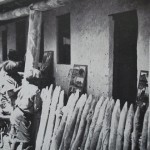 20th of January 1942. 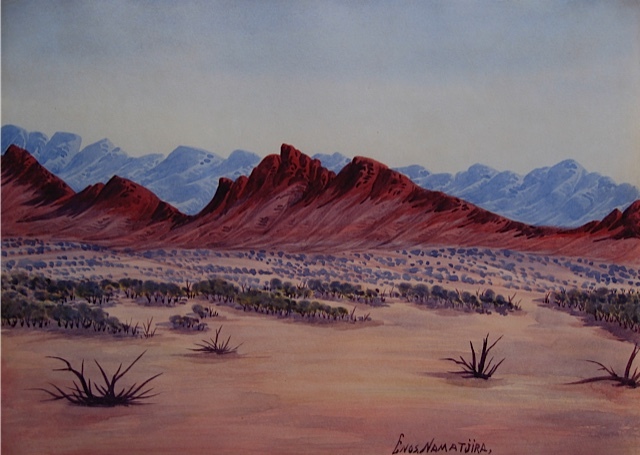 Oscar was born in 1922. 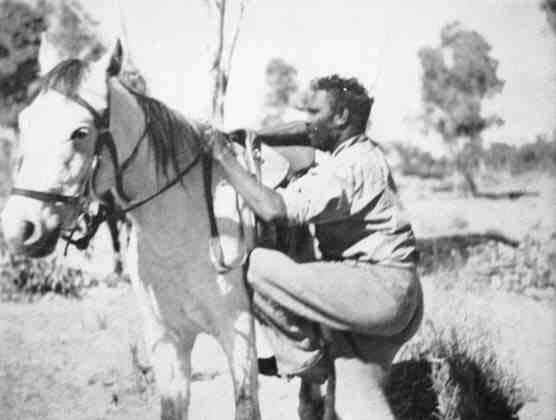 He attended mission school before joining the Army Labor Gang in 1942. 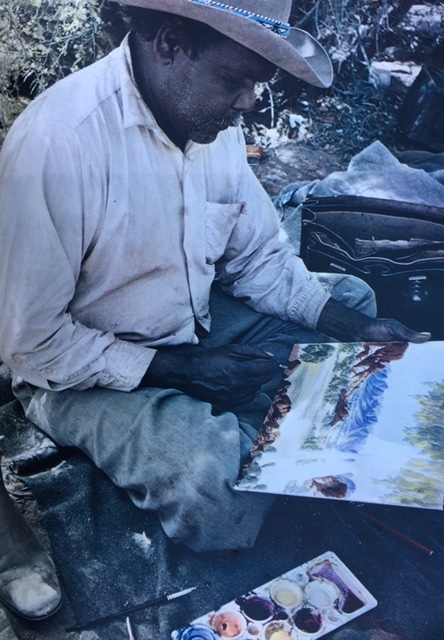 Three years later he returned to the mission and took up painting. One of Oscars first jobs was to drive his fathers truck. 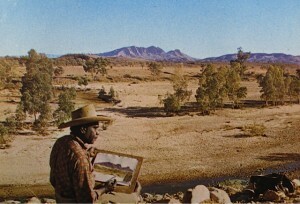 Oscar would drive Albert to his various painting spots and leave him with supplies. 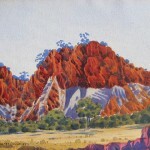 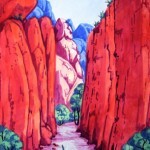 His works were signed Oskar Namatjira. 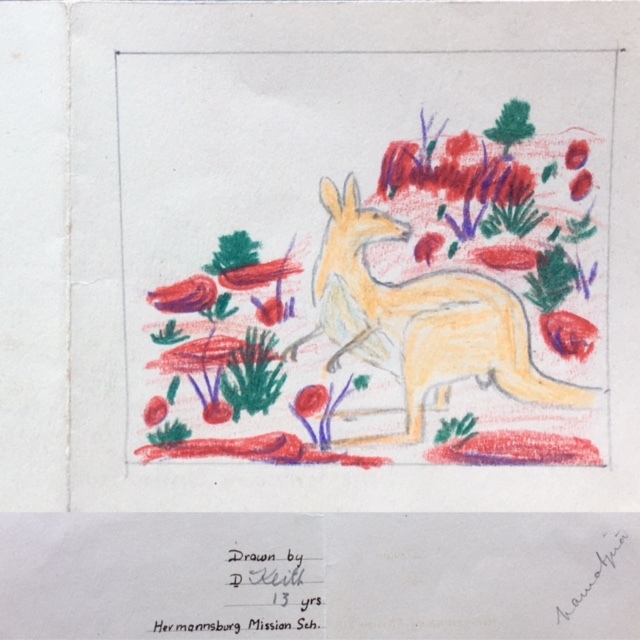 Ewald was born the third son of Albert and Rubina on the 11th of July 1930. 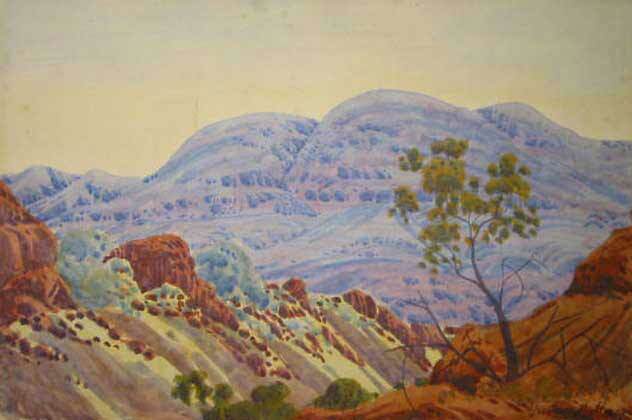 As a child he often accompanied his father on painting trips. He took up painting in 1947. 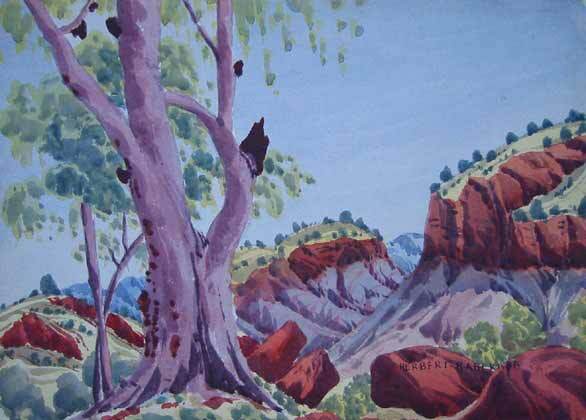 Rex Battarbee noted that Ewalds work showed a lot of originality and that it displayed strong atmospheric and decorative qualities. 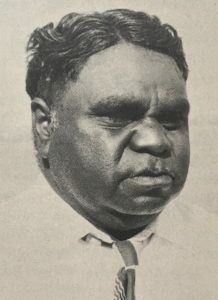 In 1949, at the age of 19, he was involved in a hunting accident with a rifle which cost him the sight of his right eye. 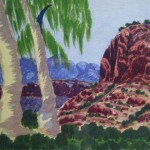 He recovered from the injury and continued to paint. 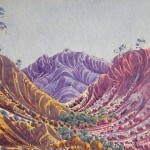 He made brilliant use of golden yellows and purples. 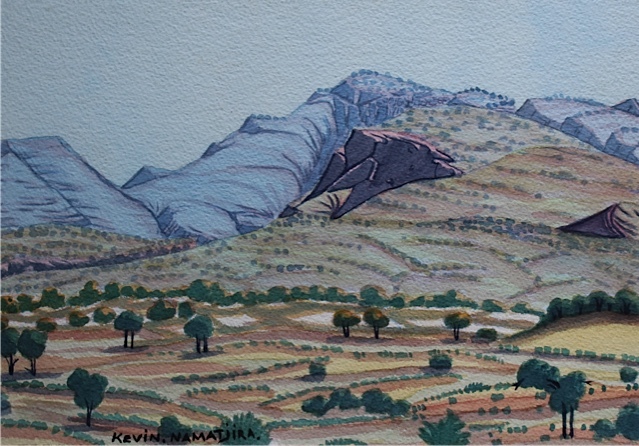 Keith was born the fourth son of Albert and Rubina on the 13th of June 1938. 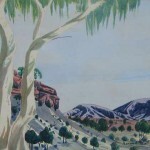 He accompanied his father on interstate trips and was present when Albert was introduced to Queen Elizabeth in Canberra in 1954. Keith features in the documentary film Sons Of Namatjira which exposes unethical practices in the emerging Aboriginal art market. 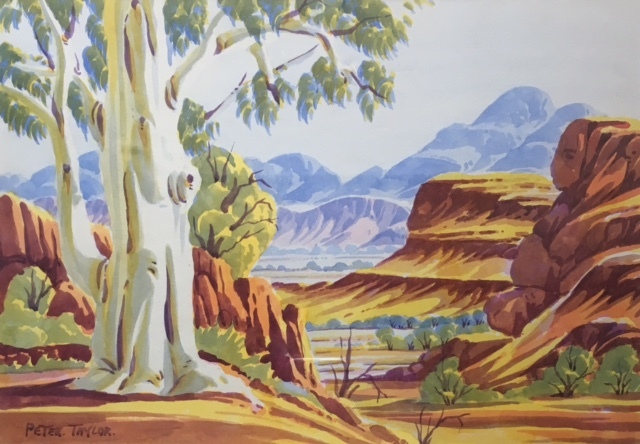 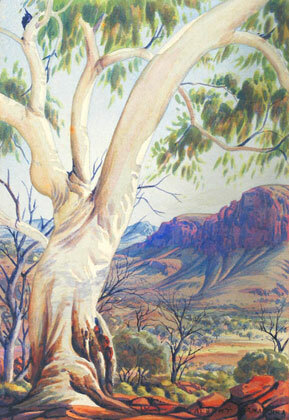 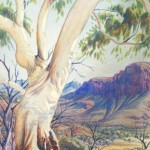 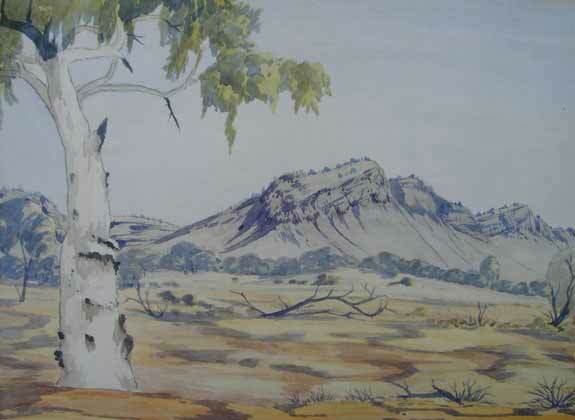 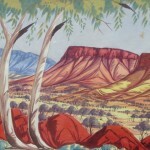 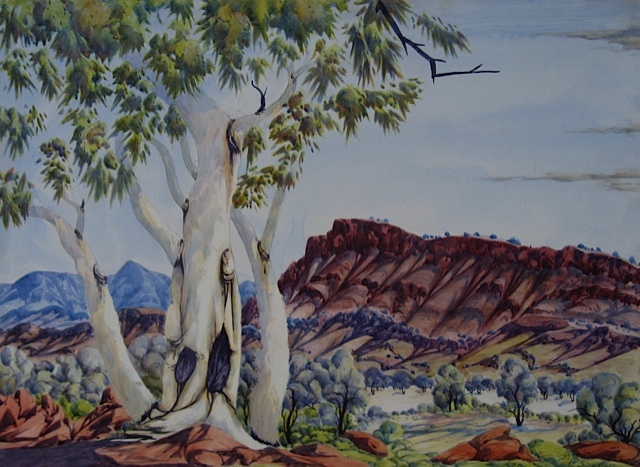 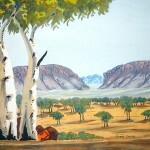 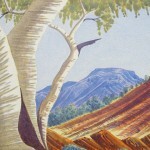 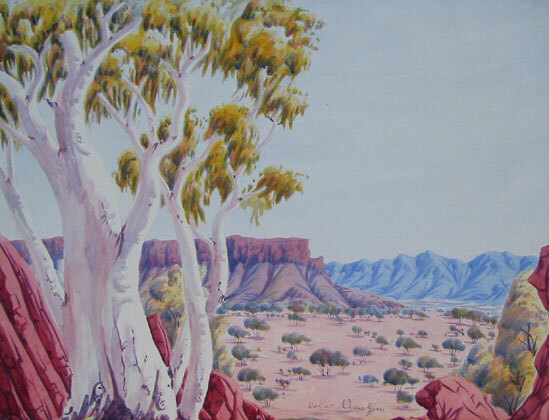 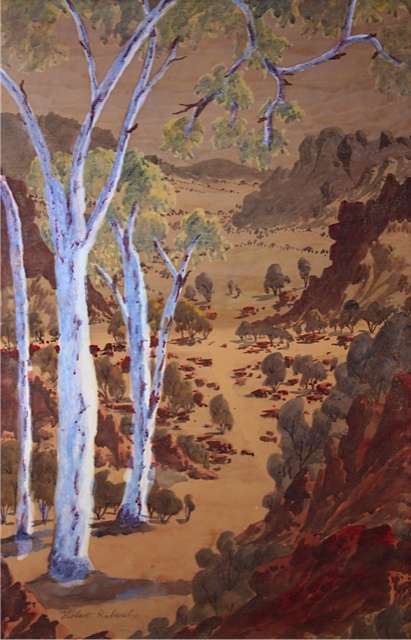 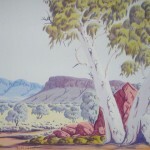 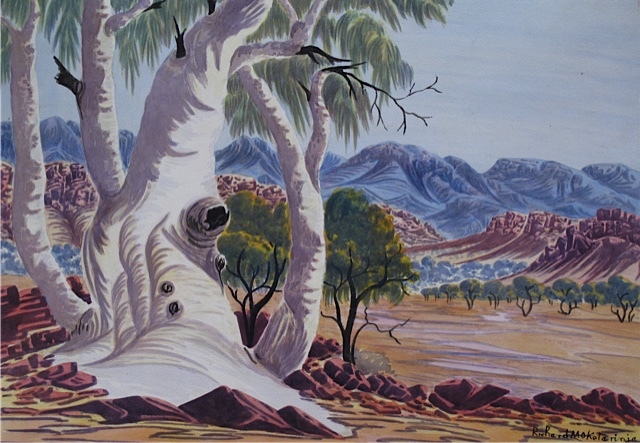 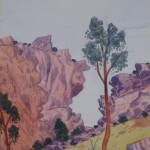 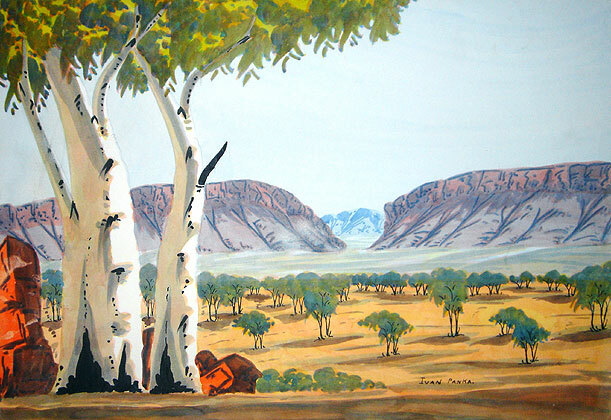 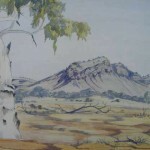 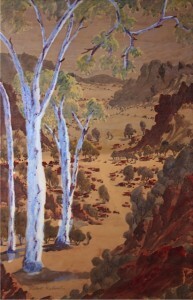 A feature of his later work is his expressive ghost gums. 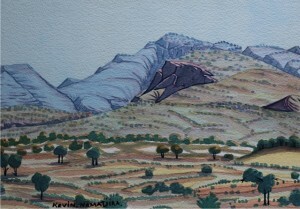 Maurice was born the fifth son of Albert and Rubina in 1939. 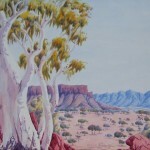 He took up painting in the late 50s. 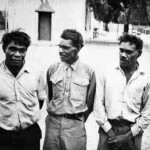 The three Pareroultja brothers were born the sons of Kristian and Auguste. 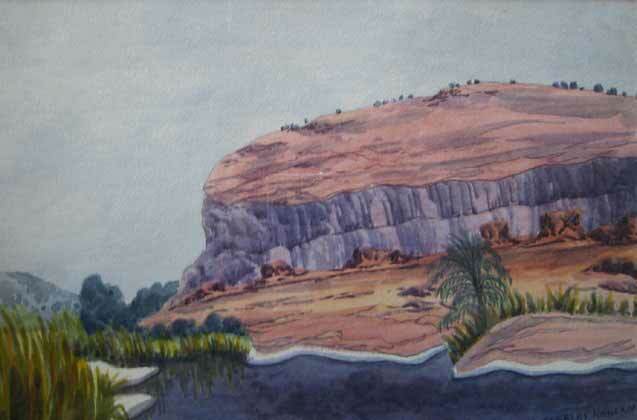 They were named the ancestral site of ‘Pareroultja’. 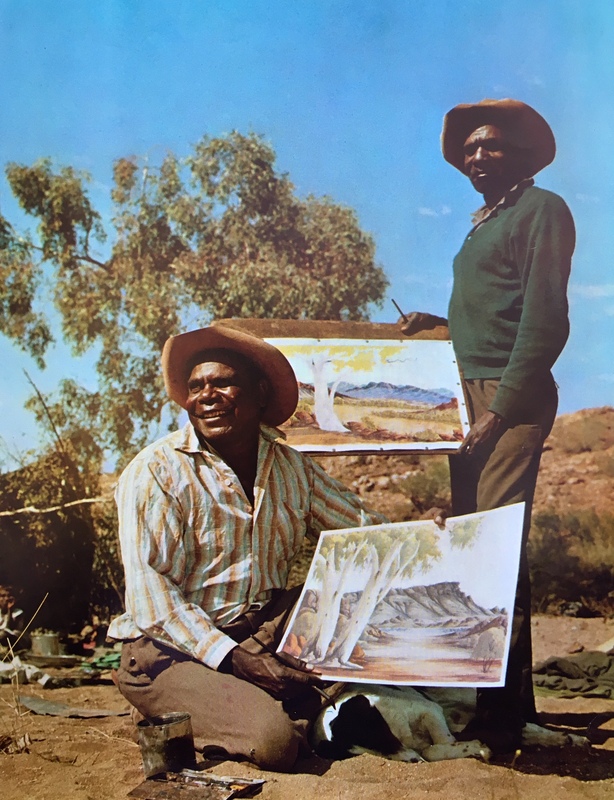 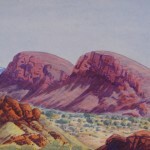 The Pareroultja brothers were recognised for their divergence in artistic style from that of Namatjira. 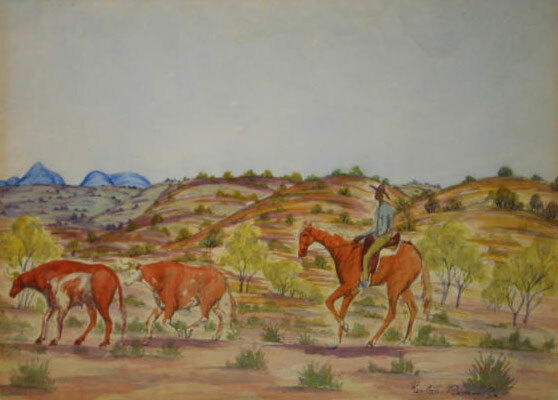 Rex Battarbee credits Edwin for leading this breakaway and notes that Edwin also encouraged his brothers, Otto and Reuben, with their art. 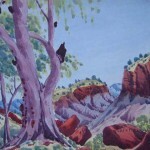 “There are several major native-cat totemic sites to be found in the Mt. 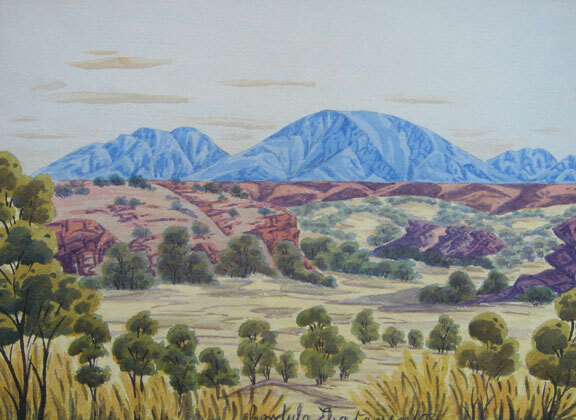 Sonder area, but all of these are located in rugged country several miles distant from the mountain. 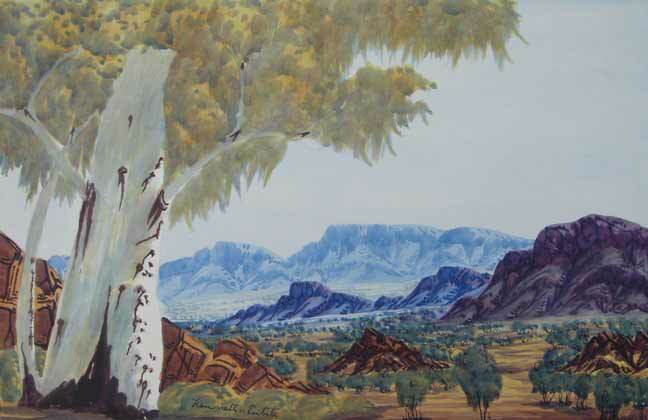 One of them is PaEroultja… once the home of the long deceased father of three well-known Hermannsburg watercolour artists originally christened Ruben, Otto and Edwin; they later adopted the name of their fathers totemic site as their own family name”. 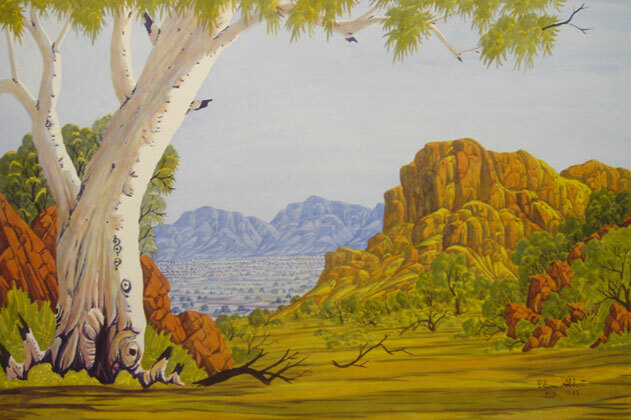 STREHLOW – Mythology of the Centralian Aboriginie. 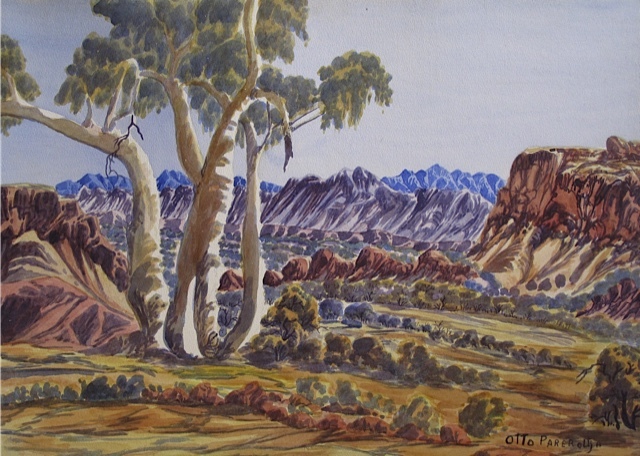 Otto was born on the 24th of March 1914. 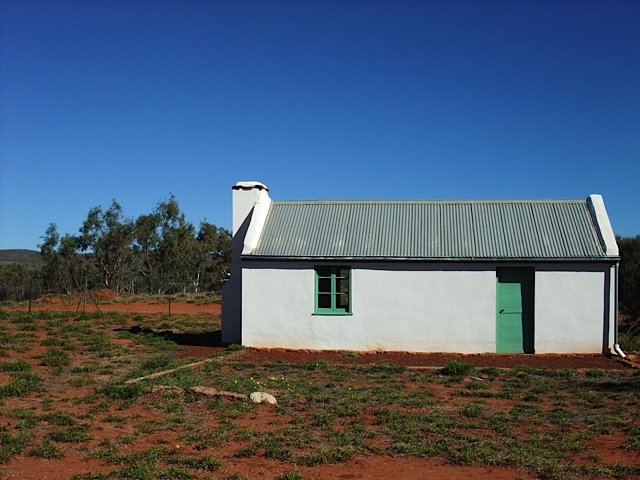 He attended mission school before working as a stockman, carpenter, shearer and gardener and served on the Native Council at Hermannsburg. 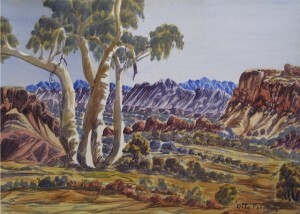 Otto began painting in 1940 but did not take it up in earnest until the mid 40s after being encouraged by his brother Edwin and Rex Battarbee. 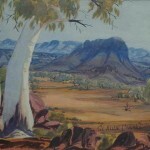 His first solo exhibition in 1947 was a sell out. His paintings express strong ancestral narratives. 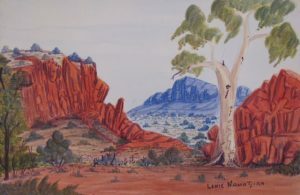 They are an account of a world privy to the Western Arrernte in which ancient mountains and trees bend and jut in rhythm with the story of his ancestry. His early works favored earthy tones but in later years he utilised a brighter palette. 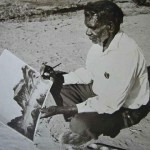 Reuben was born on the 3rd of May 1916. 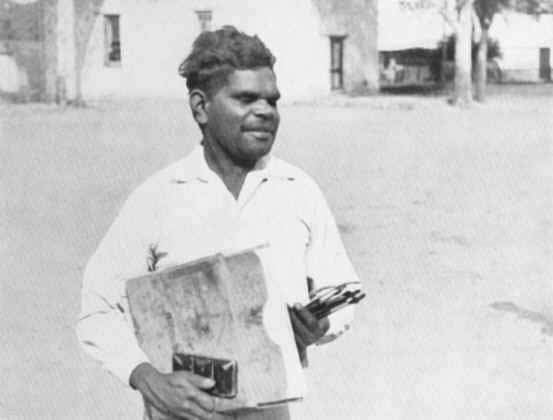 After attending mission school he worked odd jobs before joining the Army Labor Gang in 1942. 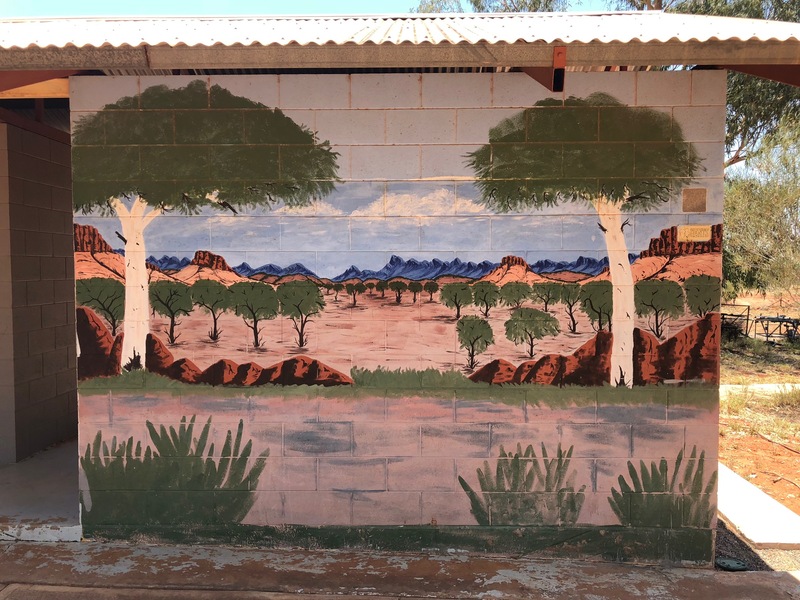 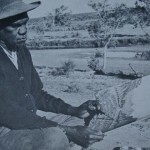 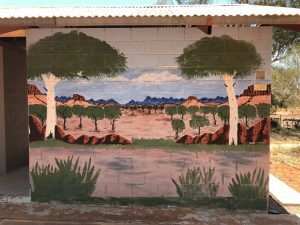 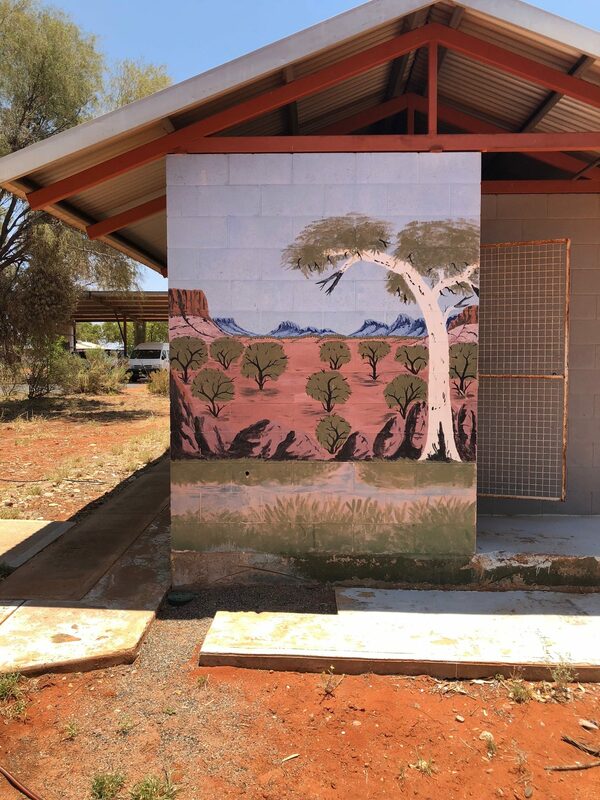 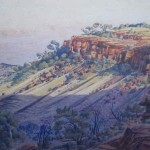 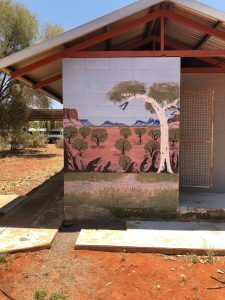 After about a year he was discharged for ill health and returned to the mission where he briefly took up painting before moving to an Aboriginal reserve west of Hermannsburg with his wife Elsie and their three young children. Reuben took up painting full time in 1945 and was one of the only Hermannsburg artists who painted figurative subjects such as people and wildlife. 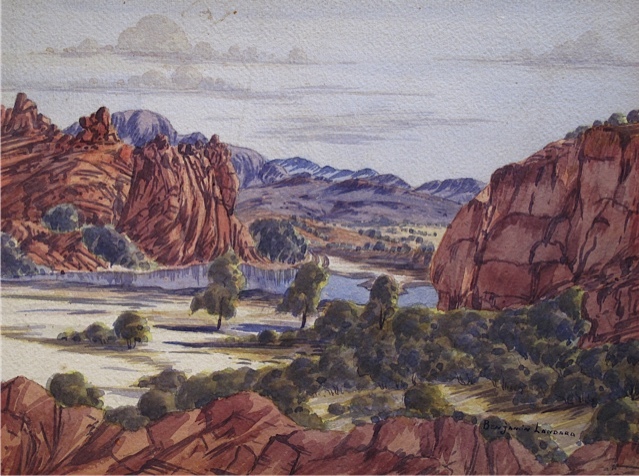 Battarbee encouraged this work but Reuben became reluctant because it was forbidden under tribal law. Reuben had a soft palette and his works are finely drafted. 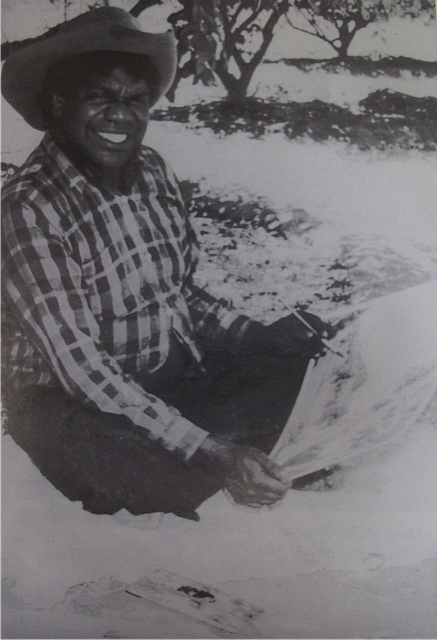 Edwin was born on the 23rd of October 1918. 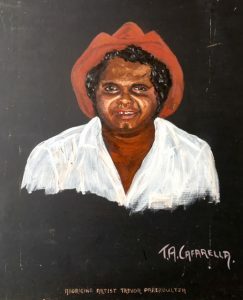 A gifted athlete, he excelled at all sports especially running. 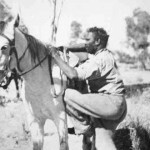 This was demonstrated at a Red Cross sports meeting in Alice Springs in 1944, off scratch he won both the 130yrd and 75yrd barefoot against the best runners from the Army and Allied Works. 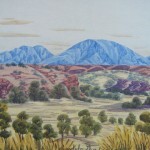 He began painting in 1943. 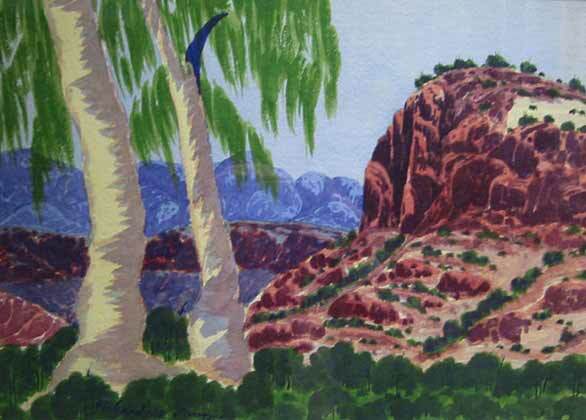 His first attempt at painting astounded Rex Battarbee who encouraged him to develop his own style. 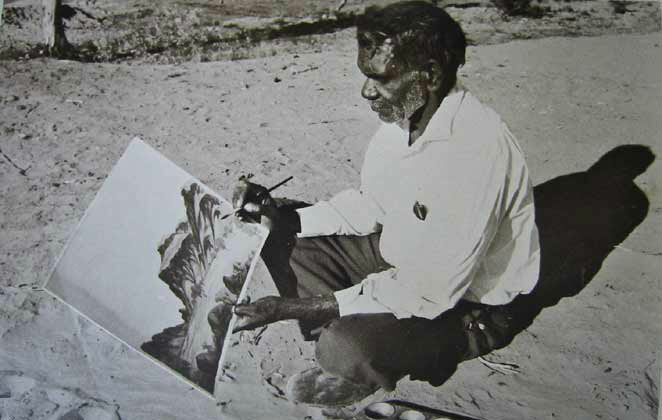 “The greatest impression any artist has ever made on me was on 25th October 1943, when Edwin showed me his first watercolour, Rex Battarbee, Modern Australian Aboriginal Art, 1951”. 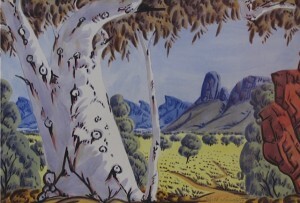 His first solo exhibition was held in 1946 at the Athenaeum Art Gallery in Melbourne. 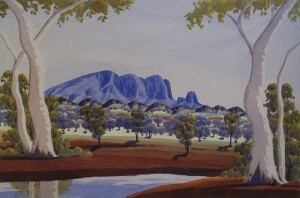 Early works 1943/44 were signed, Edwin ‘B’areroultja. 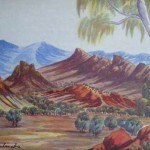 Walter was born the son of Joshua and Ruth on the 20th of October 1915. He was schooled at the mission and became proficient in the trades of stock-whip and belt plaiting. His father was the headman of the Hermannsburg group and his family were the traditional custodians of Roulbmaulbma, an area in the vicinity of Ellery Creek. 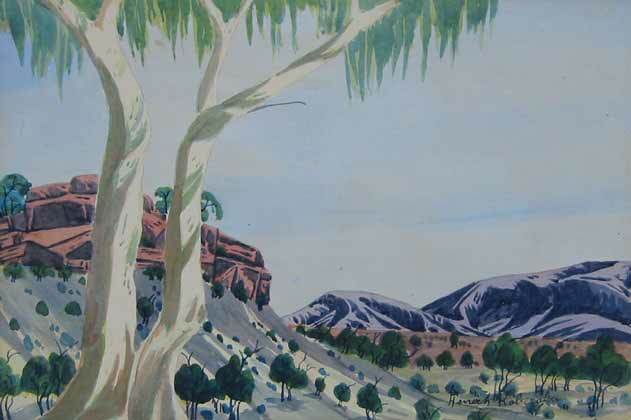 He was the nephew of Albert Namatjira and due to his kinship held tribal authority at Hermannsburg. 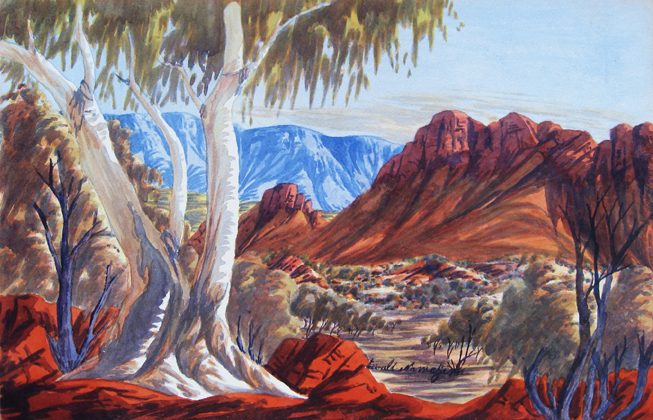 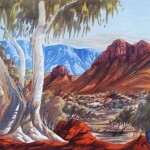 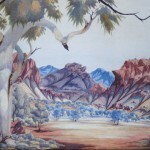 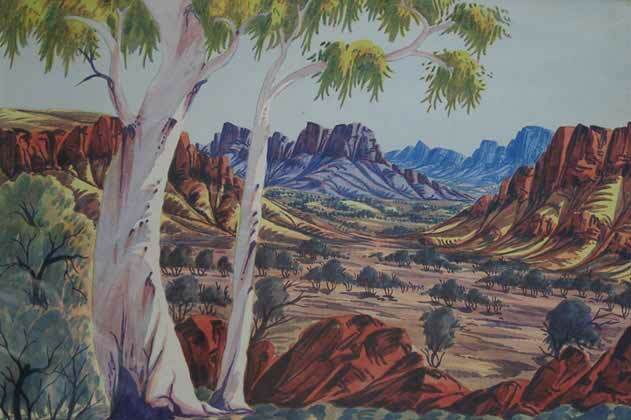 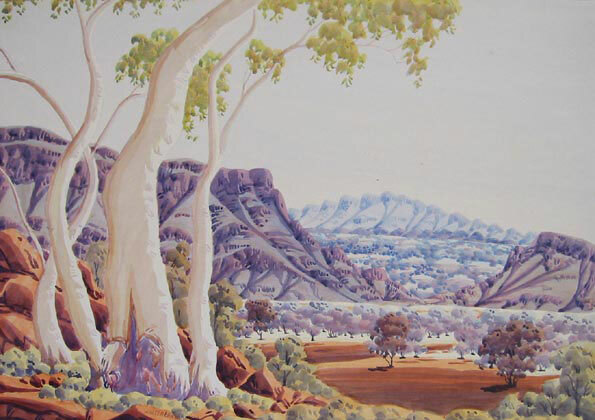 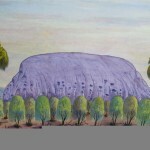 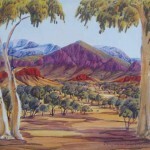 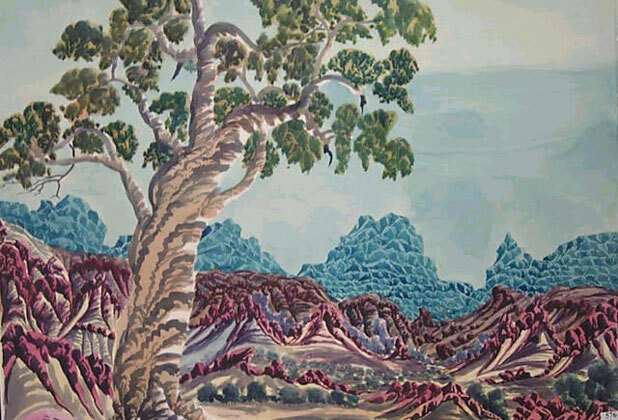 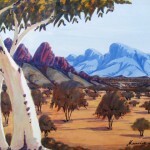 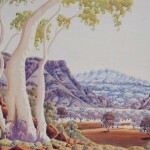 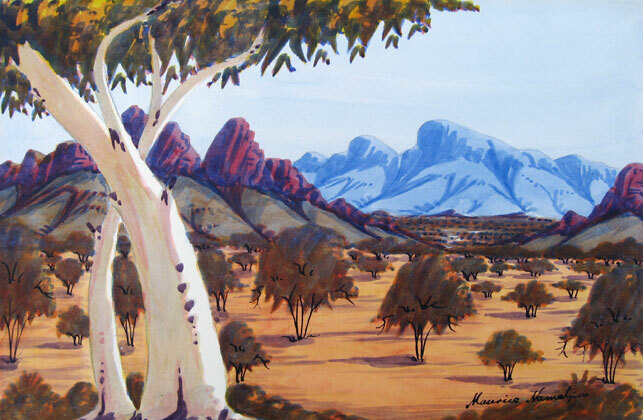 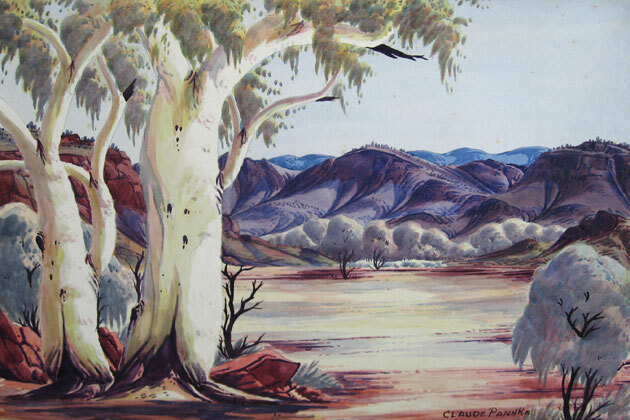 He began painting in the early 1940s under the tutelage of Albert Namatjira. 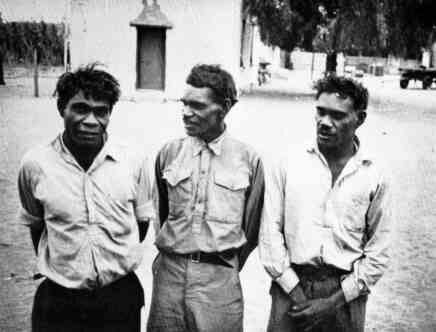 Albert was obliged to help Walter because of his tribal status. 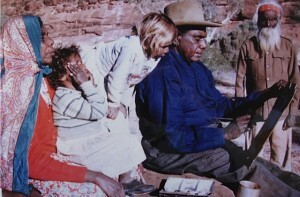 This meant he was taught before Alberts sons Enos & Oscar. 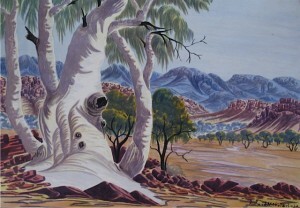 Cordula was born in 1919 and was the niece of Albert Namatjira. She was raised by Albert and married Walter Ebatarinja, with whom she had several children. 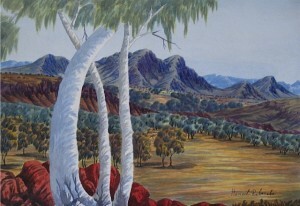 She began painting in 1950 and was not encouraged with her art to the same extent as the male artists. 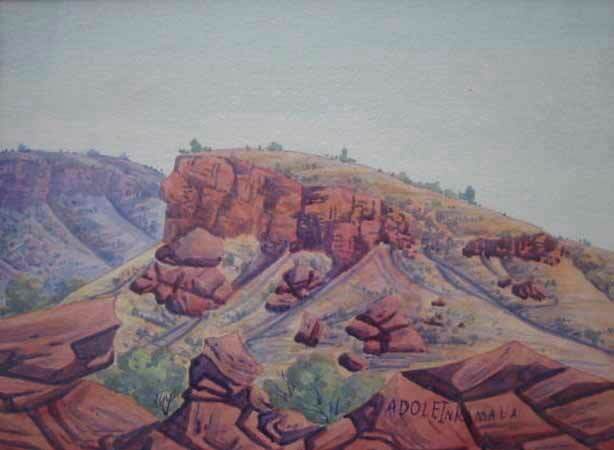 Regardless, Cordula pursued her interest and became a successful artist in her own right. One of her paintings was bought by Prince Philip at the Melbourne Olympics in 1956. 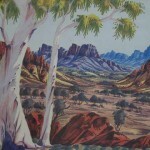 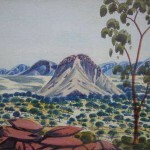 Her art is discussed in Womans Day, The Female Namatjira, 1957. 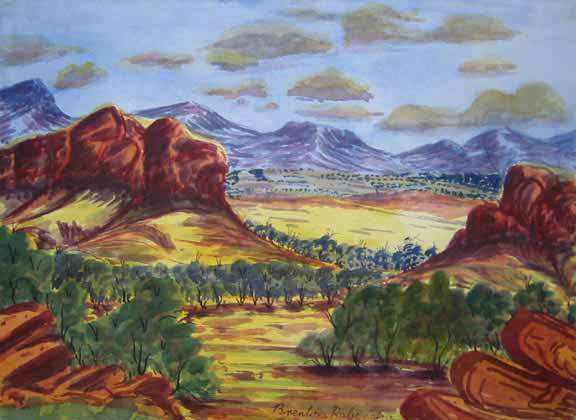 Cordula learned to paint by watching her husband Walter. 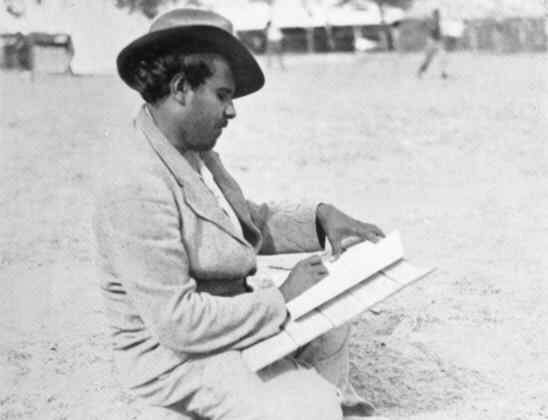 Son of Walter and Cordula. 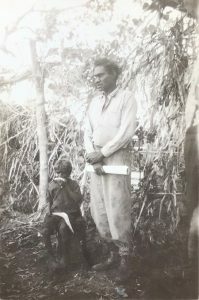 Son of Yvonne Williams and Ambrose Katakarinja, grandson of Walter and Cordula Ebatarinja. 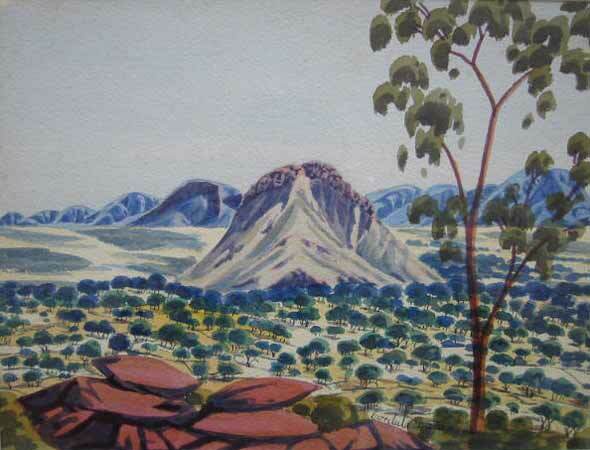 Katakarinja is the Aboriginal name for Mt Zeil. 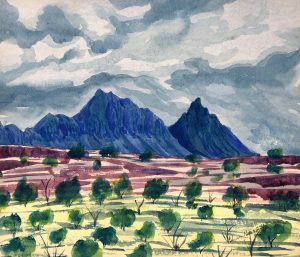 Henoch was born on the 16th of July 1914, his second name, Raberaba, means, willy-willy, or wirlwind. He had several children with his wife Regina and was the tribal brother of Albert Namatjira. Henoch was a renowned stockman and in 1944 became one of the founding members of the Hermannsburg Aboriginal Pastoralists Scheme. 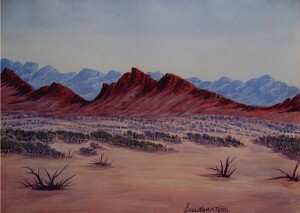 After two years he asked to be relieved of his position and returned to the mission. 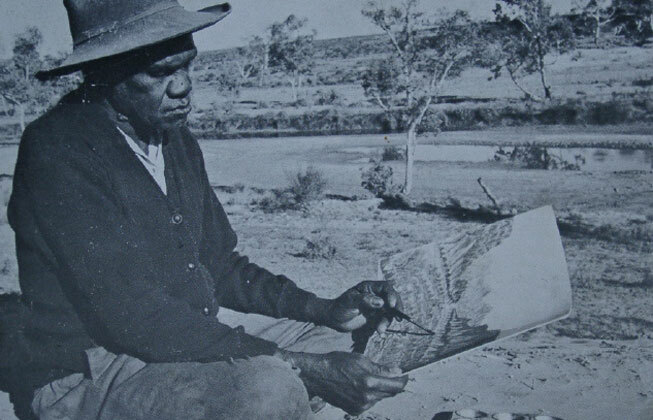 Henoch had been involved with Albert Namatira in craft making since he the early 1930s. 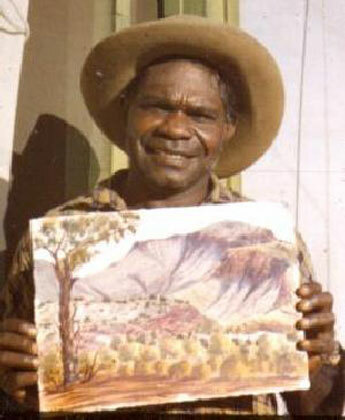 He took up painting in 1946 after joining Albert on a painting trip. 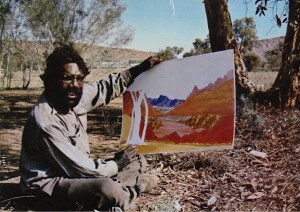 The following year he sold more paintings then any other artist in the group. 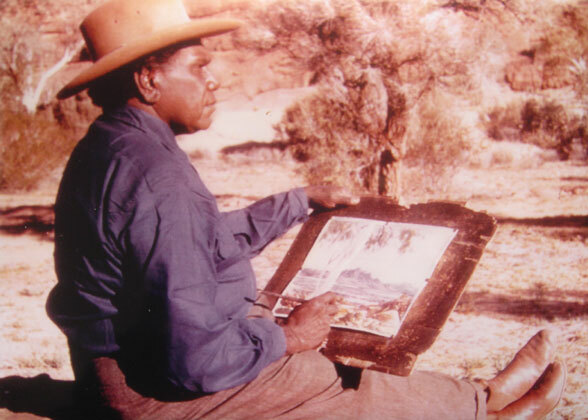 Herbert was born on the 14th of April 1920. 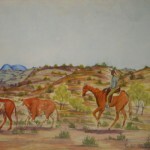 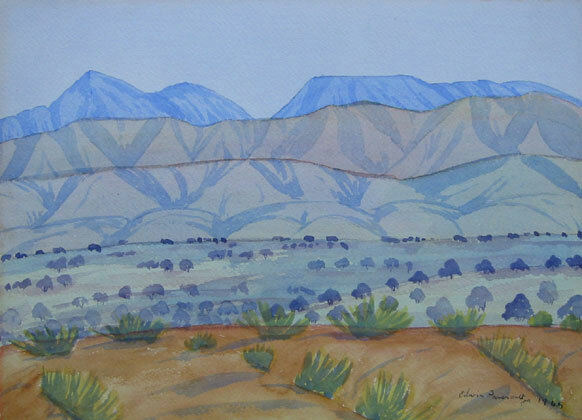 He began painting in the late 1940s and in 1951 exhibited with twelve other Aranda artists in an exhibition held by Rex Battarbee. 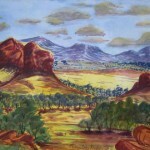 Brenton was born the son of Herbert and Arfa Raberaba at Hermannsburg on the 19th of December 1951. 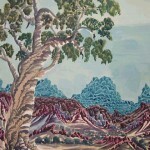 He began painting in the late 1960s. 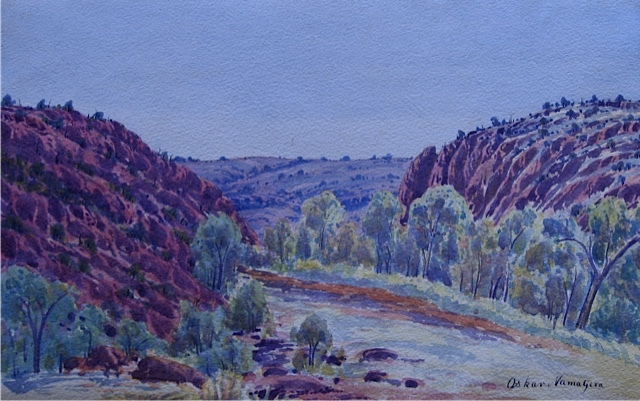 Richard was born near Hermannsburg in 1916. 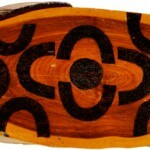 His second name, Moketarinja, means, snake curled up in a circle. 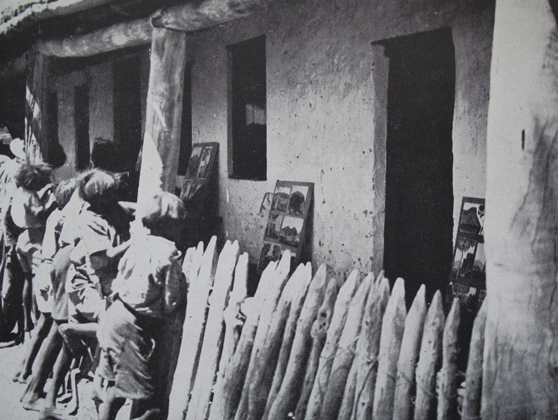 He was schooled at the mission before working as a builder at the mission. In 1940 he was invited on a one-month painting trip with Rex Battarbee who was impressed by his drawing ability and unique style. 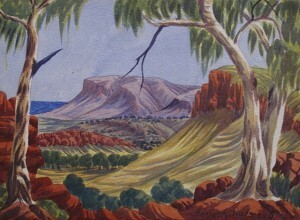 The following year he went on another painting trip at which time he was earning a reasonable living from painting on boomerangs. 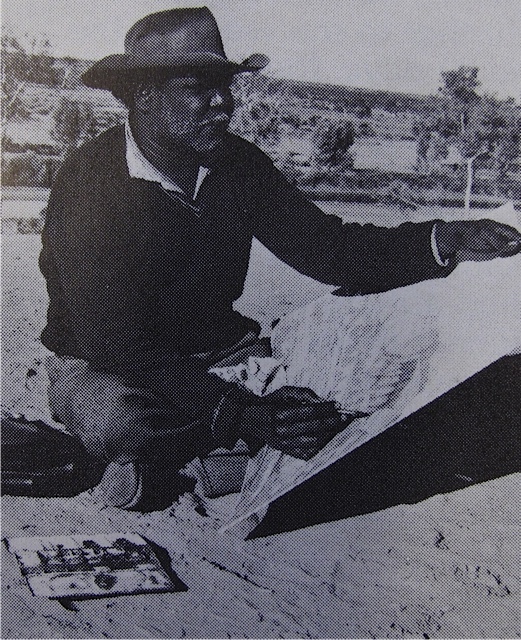 Despite his artistic success he opted for a career change and joined the Army Labour Gang. 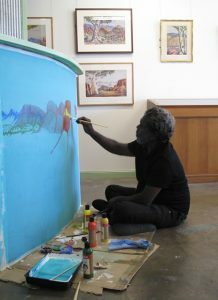 After three years he returned to the mission and took up painting once more. In 1948 he painted more pictures then any other artist but due to his unique style his works achieved lower prices. 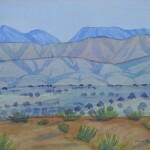 His stylized landscapes resonate strong ancestral tones. 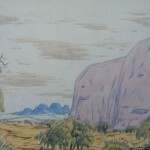 Son of August and Naomi. 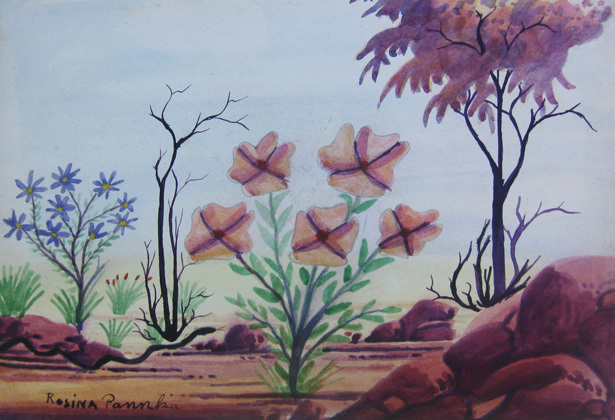 His was a close relative of Walter Ebatarinja and signed his early works Benjamin Ebatarinja. 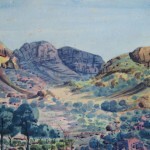 Benjamin married Albert Namatjiras eldest daughter Maisie. 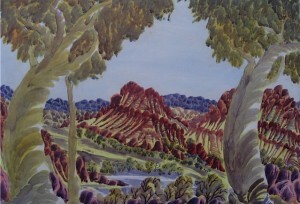 He took up painting in the late 1940s and would often paint with Albert. 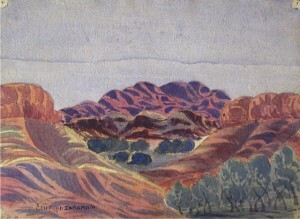 Albert encouraged Benjamin with his art and some of his early works show this influence. 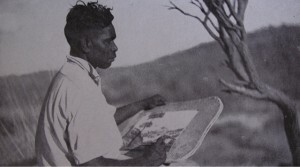 Son of Reinhold and Clara Inkamala, nephew of Albert Namatjira. 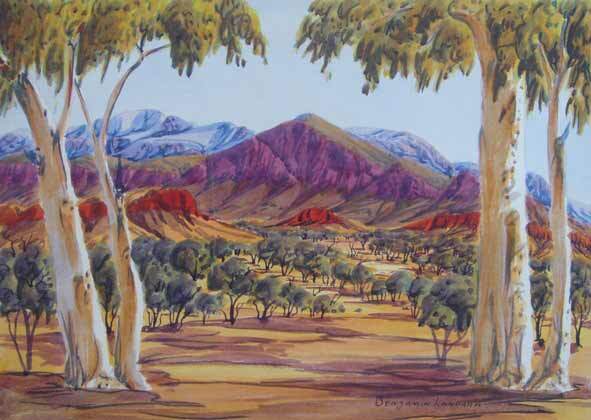 He began painting in the mid to late 1940s and was a pupil of Albert Namatjira. 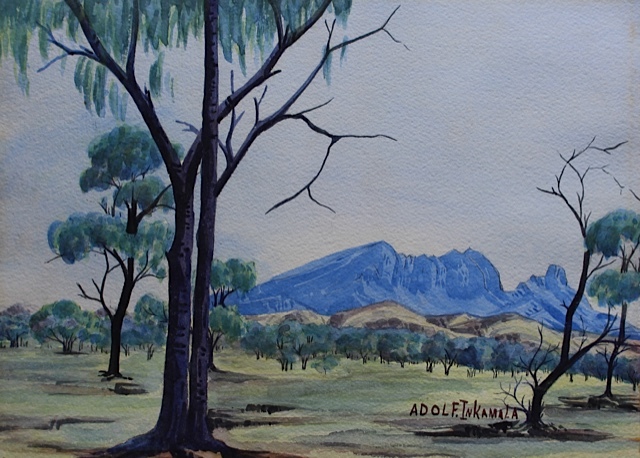 In the early 1950s Adolf was granted permission to run a commercial cattle heard on land West of Haast Bluff, a venture which proved to be successful. 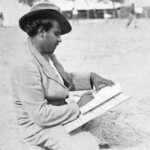 Son of Reinhold and Clara Inkamala. Son of Anthapa and Sandra, born at Tempe Downs in 1928. 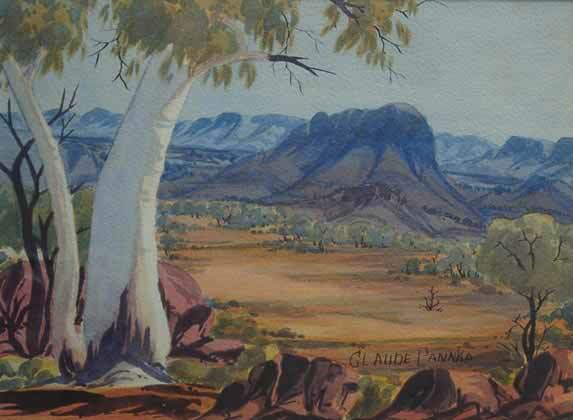 Daughter of Claude and Rosina Pannka. 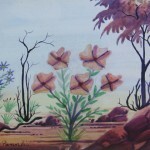 Son of Anthapa and Sandra. 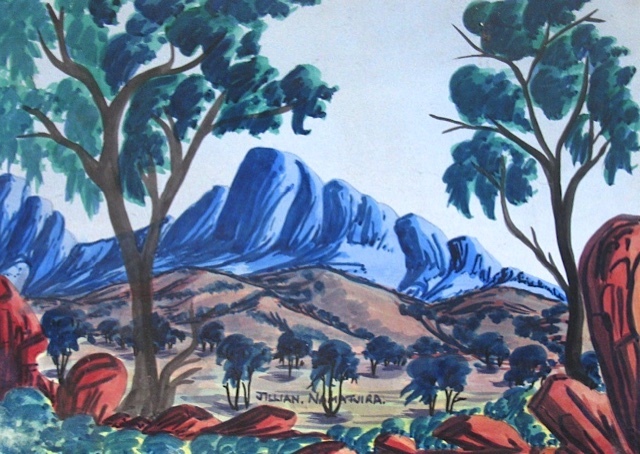 Gustav Malbunka was born the son of Hezekiel and Julanta Malbunka at Hermannsburg on the 11th of february 1909. He joined the Army in the 1940s. 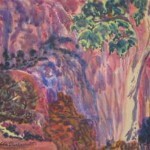 He began painting during the 1940s and produced only a small body of artwork. 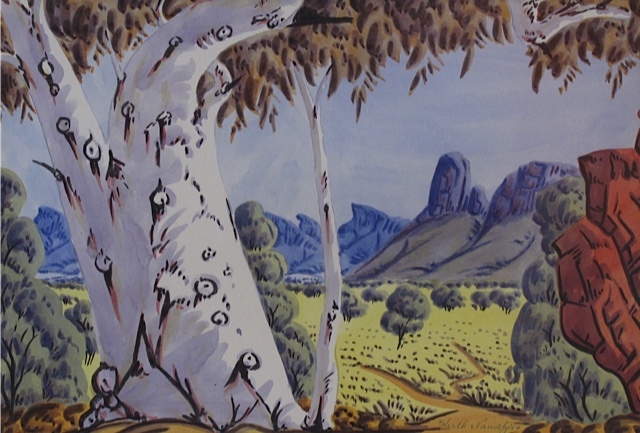 One of his works painted in 1951 was titled, Cubism in Aranda Country, by Rex Battarbee. 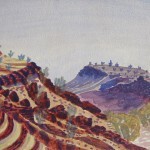 He later embarked on a venture to run a pastoral business with his family. 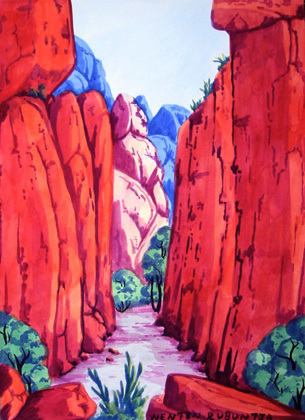 Son of Rolf and Millicent. 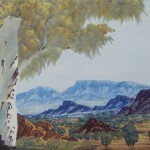 He began painting in the 1950s. 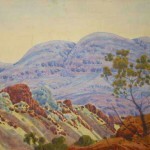 Son of Arthur and Katie Abbott. 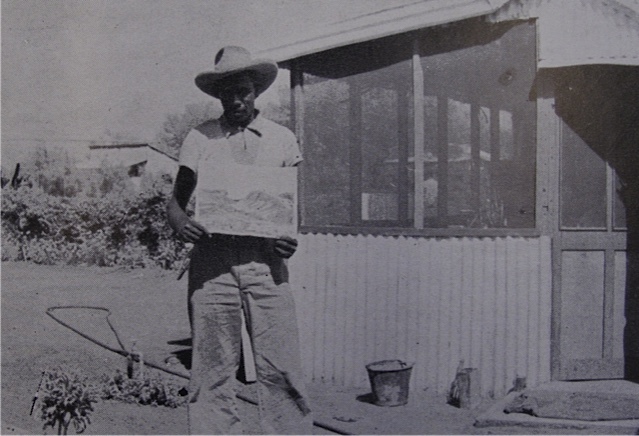 Son of Bob Rubuntja, born at Burt’s creek in the 1920s.